The 1SKB-CV22W is a rolling cymbal vault that can protect and transport cymbals up to 22 inches. The 1SKB-D5514 is revolutionary Roto-molded D-shaped drum case design with molded in feet for upright positioning and stability. The SKB-DH3315W provides the quality protection you need to protect valuable gear. The SKB-66 is designed for traditional electric guitar body styles, both left and right handed Strat and Tele type guitars. The 1SKB-SC88NKW soft case is constructed of wood framed walls and an outer 600 Denier nylon covering with a completely padded interior. The premier drum stick gig bag. 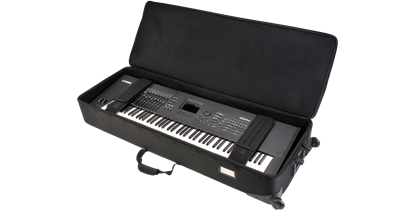 The 3i-5014-KBD 76-note keyboard case features a combination foam/cleat interior, which holds the instrument securely during transport. Adhesive backed foam in the lid also secures the keyboard. 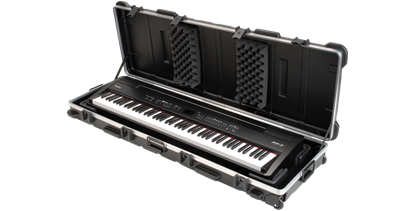 The 3i-4214-KBD 61-note keyboard case features a combination foam/cleat interior, which holds the instrument securely during transport. Adhesive backed foam in the lid also secures the keyboard. The new 3i-3614-TKBD iSeries 49-note Keyboard Case is waterproof, military grade and features an all-new Think Tank-designed interior that's fully customizable with repositionable Velex-covered foam pads to ensure a perfect fit—even if your gear changes.